Welcome to the inaugural post for the Old Bag. First, I would like to explain the term Bag. I believe this to be a Detroit term for an Illustration Student’s portfolio. I believe elsewhere in the States, students just had their portfolios. The idea of the Bag stems directly from the conditions of the illustration market in Detroit during the 1960s and 70s. Because of the Auto Industry, Detroit was a Mecca of advertising jobs during that period. A lot of these jobs where illustration in nature. To meet this market, Detroit was home to numerous Illustration Studios. New talent only had to show up in Detroit and haul their “Bag” from one studio to another until they were offered a position. Unlike a freelance illustrator trying to land a client with a focused portfolio highlighting one or two styles, the “Bag” needed to be diverse, highlighting all the talents of the young artist. As a young gun, you never knew what a studio would need. Maybe they had a great car painter, but needed someone else to paint the figures in those illustrations. Or, maybe they had all the painters they could use, but needed someone to do marker comps. By my first year at Center for Creative Studies, in 1997, there were only two illustration studios left in the metro area. Even so, some of the best artists to ever go through the Detroit market were still part of CCS. As their student, I was exposed to the rich history of Detroit Illustration and to the “Bag” mentality. This blog is dedicated to those guys and the impact that they have had on me. Even though this is my inaugural post for the “Old Bag”, this assignment comes not at the beginning of my time at CCS but somewhere in the middle. I have chosen this topic for a couple of reasons. The assignment was for Mike Mikos, who was one of two primary instructors that I studied under at CCS. One of my subjects for the assignment was Bob Blanchard, my other primary instructor. And finally, it might inspire you, the reader, to look up C F Payne, who is and was a dominating figure in American Illustration. 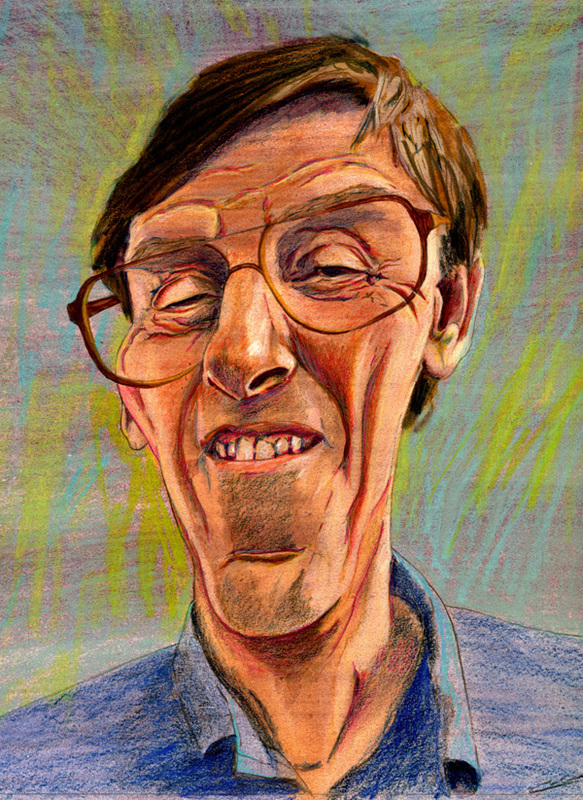 Christopher Payne rocked the 1990s with his unique approach to caricatures. His technique was built around a quick turn-around time and so his art could be seen on the cover of magazines like Time and Newsweek, where an artist would only get two to three days to finish an illustration. Because of the changing market of the 1990s, one of the things CCS would do for their illustration students was bring in some of the top talent for presentations and demonstrations. Mike Mikos and Nelson Greer had the foresight to record these demos for future students (like myself). C F Payne was one of those artists that had come through CCS before my time there. However, Mikos loved Payne’s technique. He thought it was a great way to introduce flesh tones to his students. And so, once a year, every year Mikos would pop out the demo for his students and come up with some big show that used this technique. During the Spring of 1999 I was taking one of Mikos’ illustrations classes. I believe that because I was a transfer student I had to catch up on Illustration II. Mikos’s concept for that year was a “Faculty” show, thinking it would be good fun to let the students do caricatures of all their teachers-liked or disliked. Mikos supplied the photo references. We all drew faculty names at random for the assignment and were allowed to pick one for extra credit. 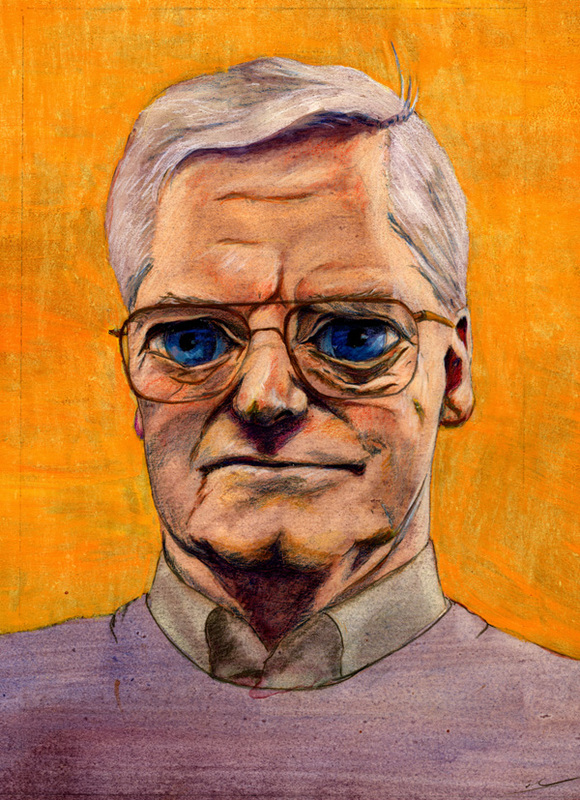 I drew Larry Fleming who taught art direction. I had no personal connection to him and his reference shot was one of indifference. Bob Blanchard’s photo was left over from the draw. You could tell Bob was excited about the project by his expression from his shoot and so I grabbed it for the extra credit. 1) Create an under drawing-I used sepia Prismacolor pencils for this step. 2) With acrylics, paint in your flesh high light tone. At this stage, you can also lay in your darkest shadow colors. It’s important to cover your pencils with the acrylics as they seal the color pencils from step 4. 3) Using watercolors, apply your mid tone over the acrylics. You then use clean brushes with water to pull away your highlights. 4) Using oils, you create a turp-thinned down shadow tone in which to cover your piece. This pulls the whole image together. If your colored pencil lines did not get sealed they will dissolve from the oils and solvents. Next, take a clean kneaded eraser and wipe away the oils from the high lights and mid tones. 5) This last stage relies on Retouchable II from Suregaurd. It’s a professional photo lacquer. You spray this over your piece to seal it. The spray not only acts as a matte varnish, but it also gives you a bit of tooth. With this new layer of tooth, you can clean up and do detailed work with colored pencils. If the pencils start to build up and get waxy on you, hit the piece with some more spray. when you apply the washes, do you do the wash over the entire thing? It scares me to cover my whole piece in a darker toned oil. Am i just supposed to erase it all out that I don’t want that dark? Or do you apply the tones to specific areas? These are some great questions. With the C F Payne technique the answer for the oil wash is yes. Wash the whole piece in your darker tones. This will unify your underlying colors. Because you have water colors and acrylics below the oils, you will be able to work the oil pigment off the board with your kneaded eraser. Again, I love Strathmore Cold Press Illustration Board for this technique because it has a little texture. Some of the oil wash will get into this texture even in your high key areas. If you really want to pull all of it off, say in a highlight on the nose, you can wipe it with turps or another mineral spirit. Of course, the turps won’t affect the acrylics, but you’ll notice that the clean color no longer feels as good as the slightly blended colors. With the Gendron technique the answer is both yes and no. You can cover the whole piece in a wash and wipe away areas with your kneaded eraser. But you can also lay in colors locally. When I do that I try to work a few local colors onto a layer of crystal clear. As you build up your crystal clear, things can get blurry. Also, just because the Crystal Clear is dry, it doesn’t mean the oils are. So as you wipe away above them the pressure of pushing down with the eraser can cause them to spread underneath the Crystal Clear. Working thin will help avoid any spreading. You say here to put acrylic right on top of the colored pencil then watercolor on top of the acrylic. Won’t the plastic quality of the acrylic cause the watercolor to resist adhering to the surface? Seems to me water color and acrylic on top would make more sense. The acrylics dry and bind with the board. But its a wash, so the texture and, in the high spots, some of the board is still coming through. Once dry, the acrylics become a stable skin of pigment. The water color wash should be a little thicker than the kind of wash that you would do in a traditional watercolor painting, but doesn’t need to be much thicker (when it dries you should notice the tinting – if the tinting doesn’t change the base color to a mid-tone, get it damp and wash in some more pigment). Here’s the big thing. You let the water color dry. And then you take a damp brush and pull the water color off the areas where you want the high lights to come through. Big brushes, little brushes, its up to you. I use medium brushes to pull up the large, rough shapes of the high lights and then work into smaller brushes for my detailing. If you flipped the process and put an acrylic wash over a watercolor wash, the acrylic wash would seal both layers when it dried.